By Adnan Basrai I, like many of my fellow Americans, like the low level that oil prices have been stagnating at. With gas at just above two dollars a gallon, the average consumer can’t help wonder why he is paying such low prices to fill up the tank of his Ford Explorer, and who he should thank for it. Is it a matter of a change in US politics and international trade law on oil and natural gas, or should credit be given to domestic producers and the resulting economic growth? Or maybe it has something to do with Russia…those guys are always in the news, and they have oil, right? Maybe Iran? Although these countries have contributed their fair share to the fall in gas prices, it is mainly Saudi Arabia and its petro-economy that we should be thankful to for our cheap oil. Saudi Arabia possesses enormous oil reserves. With more oil than it could possibly use, Saudi Arabia sells most of its petroleum products to international markets, enriching its national coffers. With the profit from international sales, Saudi Arabia heavily subsidizes its domestic gas process. Its policy of ensuring that its residents feel minimal pain at the pump results in the average Saudi paying less than 50 cents per gallon for gas at a pump in Riyadh . Saudi Arabia’s production levels are so high that that they have also had the ability to maintain 268 billion barrels of oil in reserve, should they ever encounter problems that require fixing by flooding a market with oil (not literally of course!) . Saudi Arabia’s experience with keeping domestic prices artificially below the market equilibrium, along with its oil reserves supporting its ability to sustain these deflated prices, means it can undercut and, in the long-term, destroy any newcomers into the fossil fuels market. The most recent contenders to Saudi Arabia have been US and Canadian producers, with their high-tech fracking techniques and their countries’ enduring vision to be energy independent as soon as possible. Hydraulic fracturing, or ‘fracking’, is being used by the American and Canadian producers as one of the most efficient ways to extract natural gas occurring within shale rock formations. It is a well-stimulation technique, in which a hydraulic liquid made up of water, sand, and other chemicals fractures rocks in the ground to extract the oil out of them . The emergence of hydraulic fracking in places like Alberta and North Dakota has ramped up North American oil production at an exponential clip, such that it brings about the possibility of the US being an exporter of oil in the near future. This would mean that the country would soon no longer have to rely on the Middle East for its oil and could become energy independent, setting a major milestone for US growth and sustainability . Over the past eight months, the price of Brent Crude, a form of crude oil  that serves as the major benchmark price for worldwide oil trading, has dropped from $115 a barrel to more than half that amount at $49 a barrel. This drop was due to, among other factors, an increase in oil and gas production in the United States and Canada . OPEC is an organization where major non-US oil producing countries protect their interests and guarantee their income by coordinating policies and prices among them, essentially a form of implicit collusion. Saudi Arabia is OPEC’s second largest member. In response to the perceived threat of North American production, Saudi Arabia has used both its market power over oil supply and dominance within OPEC to make the organization let prices fall in hopes of “killing off the competition” .The United States’ dependency on, and alliance with Saudi Arabia is largely influenced by their inability to become energy independent. Cutting Saudi oil production would, in the long-run, allow the US to supply their own energy consumption, and no longer need to maintain an alliance with the Middle East to fuel (no pun intended) their demand for oil. This, along with the drop in world oil prices due to the US production boom, cost are very costly for Saudi Arabia. Fracking is not cheap, and oil prices need to be sufficiently high to justify making the costly investment of drilling into the ground to extract more. If the Saudis can keep the prices low enough, for long enough, profits in US fracking industries will begin to decrease, slowing down production and reducing the amount of jobs in the oil and gas sector . Secondly, cutting production would mean that Saudi Arabia would permanently lose its dominance in market share in the international markets . To them, this loss justifies dipping into their financial reserves in the near term, for the possibility of holding on to a future where Saudi Arabia, along with all the other OPEC countries, still dominate over fossil fuel markets in the long term as a cartel. Saudi Arabia has led the other OPEC countries to keep oil production high, sacrificing short-term interests over long-term goals, profits, and stability . Saudi Arabia, along with its OPEC counterparts, are in the midst of playing a game of chicken on a global scale. With prices still too low to sustain most oil producing economies (countries like Venezuela and Nigeria are far below breakeven revenue levels), it is simply a question of whether the US or Saudi Arabia will cave in first and cut production levels, bringing oil and gas prices back to a stable equilibrium. Although these two main contenders in this international dispute can sustain the price drop for a while (analysts say that US producers can break even at lower than $70 a barrel, and Saudi has its oil reserves to bear the burden of high production cost amid low prices), many of the other OPEC members are already suffering because of it . Countries like Venezuela, Nigeria, and Iran must have prices closer to $100 a barrel to break even, and without immense financial reserves like those of Saudi Arabia to serve as their safety net, they will be in a lot of fiscal pain due to low prices and reduced profits . Analyst predict that with current forecasts, Saudi oil reserves can sustain the low prices until 2018, but most other oil producing countries will already be permanently economically devastated by then . Whether to sacrifice other OPEC countries’ futures in the interest of sustaining Saudi Arabia’s oil prosperity is a consequence this Middle Eastern oil behemoth will have to address when it’s leaders decide to keep or reduce production of their economy’s largest worldwide export. Saudi Arabia had a similar strategy when they increased production in 1987 and drove down oil prices, sending many US producers in Oklahoma and Texas into bankruptcy . This time though, the Unites States has further ramped up its production and seems better prepared for the possibility of a price war. Many analysts predict that it will be Saudi Arabia that will chicken out first and cut production levels, wanting to stop causing irreparable harm to its OPEC member countries, while losing its precious oil reserves in the process . One thing is for sure though: the current oil prices that you and I are enjoying so much are only temporary. Until either the OPEC countries’ or US producers cut production levels, we might as well enjoy driving down the highways on $2 gas! Business Insider. Here's How Much The World's Biggest Oil Players Are Are Sitting On. December 18, 2014. http://www.businessinsider.com/chart-proven-oil-reserves-2014-12 (accessed March 2, 2015). Chicago Tribune. Cheap Gas is Not Here To Stay. January 23, 2015. http://www.chicagotribune.com/news/opinion/commentary/chi-gas-prices-saudi-arabia-20150122-story.html (accessed March 2, 2015). FracFocus. Hydraudic Fracturing - The Process. 2015. https://fracfocus.org/hydraulic-fracturing-how-it-works/hydraulic-fracturing-process (accessed March 20, 2015). Gas Buddy. Historical Gas Price Charts. n.d. http://www.gasbuddy.com/gb_retail_price_chart.aspx (accessed Feb 26, 2015). Gately, Dermot. "Lessons from the 1986 Oil Price Collapse." Brookings Papers on Economic Activity, 1986: 237-284. LA Times. "Saudi's Price War on US Oil is giving us Cheap Gas. January 16, 2015. http://www.latimes.com/opinion/topoftheticket/la-na-tt-saudis-price-war-20150115-story.html (accessed march 2, 2015). Oil and Gas Financial Journal. Fiscal Break-Even Prices for Major OPEC Members. April 3, 2014. http://www.ogfj.com/articles/2014/04/fiscal-break-even-oil-prices-for-major-opec-members.html (accessed March 2, 2015). OPEC. OPEC Share of World Crude Oil Reserves. 2014. http://www.opec.org/opec_web/en/data_graphs/330.htm (accessed February 26, 2015). Plumer, Brad. 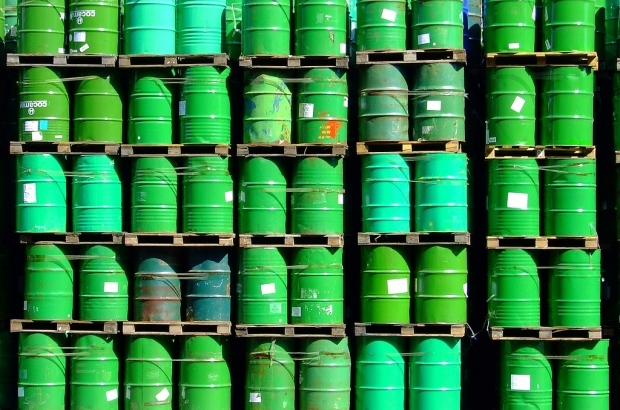 "Why Oil Prices Keep Falling - And Throwing the World Into Turmoil. January 16, 2015. http://www.vox.com/2014/12/16/7401705/oil-prices-falling (accessed March 2, 2015). The Guardian. Saudi Arabia Can Last Eight Years on Low Oil Prices, Says Former Advisor. January 19, 2015. http://www.theguardian.com/world/2015/jan/19/saudi-arabia-last-eight-years-low-oil-price-adviser (accessed March 2, 2015).